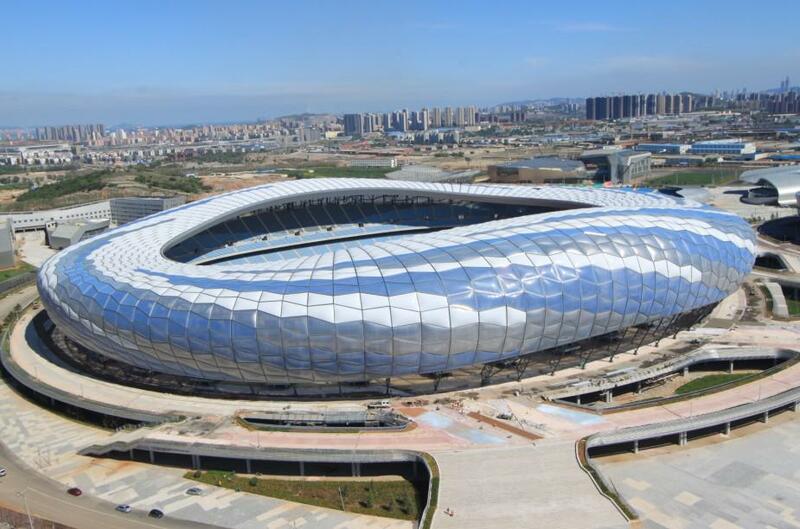 As the northern port city of Dalian was selected to host the 12th National Games, a brand new sports complex was designed in redeveloped northern district of Ganjingzi. 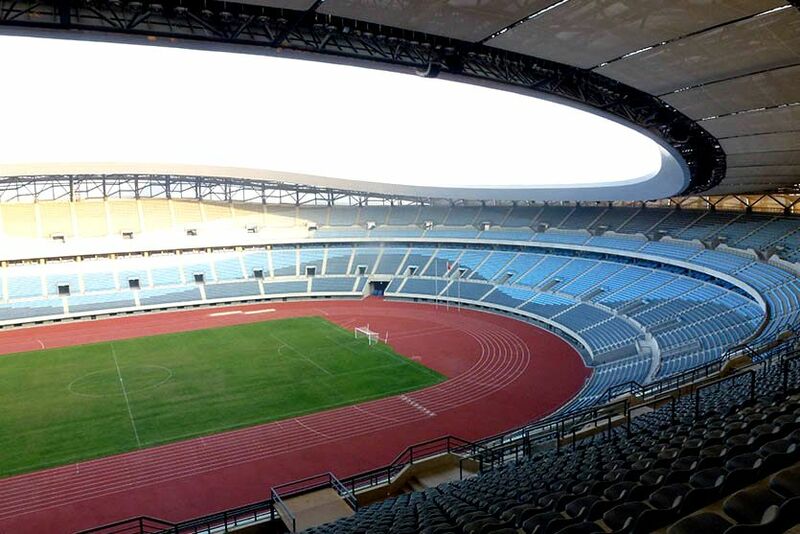 In a quarter created with new avenues there was enough room to accommodate a wide variety of sports facilities: the main stadium for 61,000 people, large indoor arena, two secondary athletic stadiums, two small football stadiums, baseball stadium, tennis courts and office/hotel buildings. 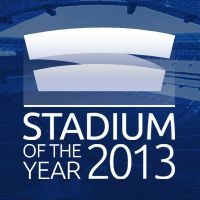 The stadium was designed by global architecture practice Nadel, using a popular outer form. 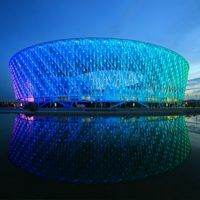 The elliptic building is covered with 2,745 ETFE cushions, known first from stadiums created by Herzog and de Meuron, most notably the Allianz Arena. 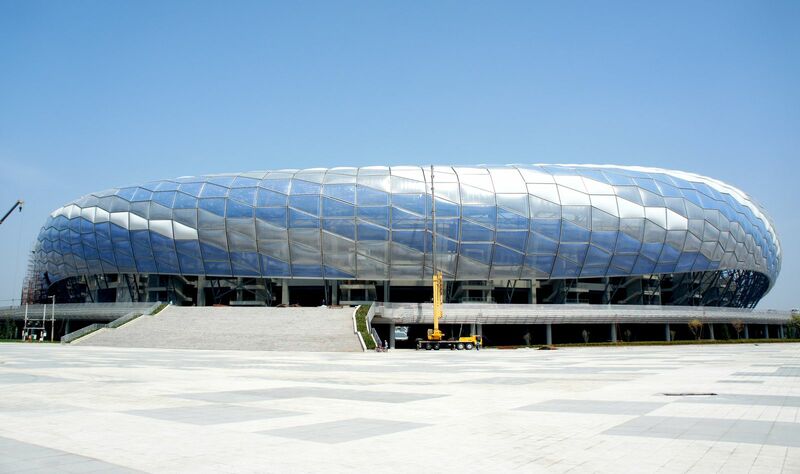 In the case of Dalian the ETFE polymer was used in three shades, white, gray and blue. Together their layout creates a whirlpool impression by day. 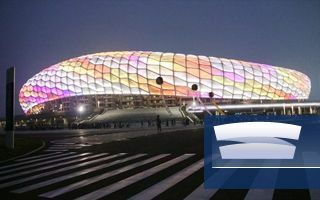 At night the shade difference isn’t visible any more as illumination of the cushions allows to display numerous colours on the stadium. 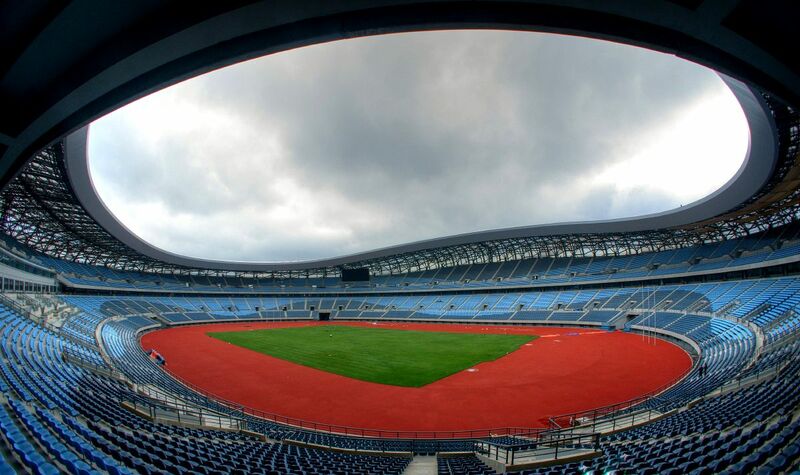 To get to the façade, spectators first enter a spacious promenade, which allows direct access to the lower of the two tiers of seating. 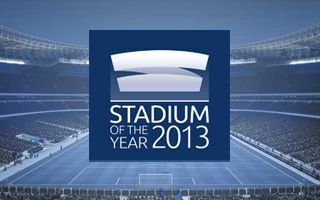 The two-tier division isn’t as visible in the main stand, where 132 skyboxes were created. 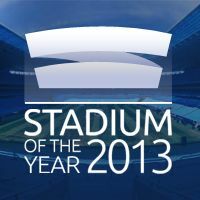 Behind them are 6 floors of space for various uses, like media, hospitality and of course the player facilities. 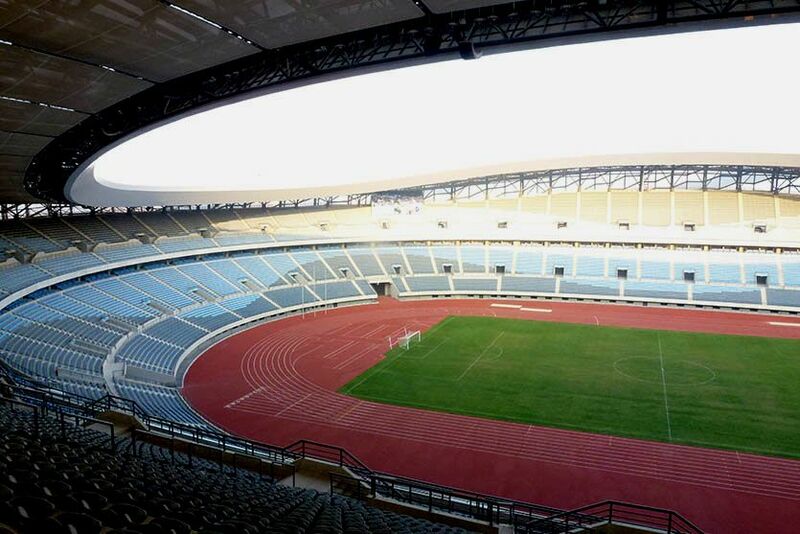 Having hosted the 12th National Games, the stadium may get a serious football tenant for at least some of the Super League games. 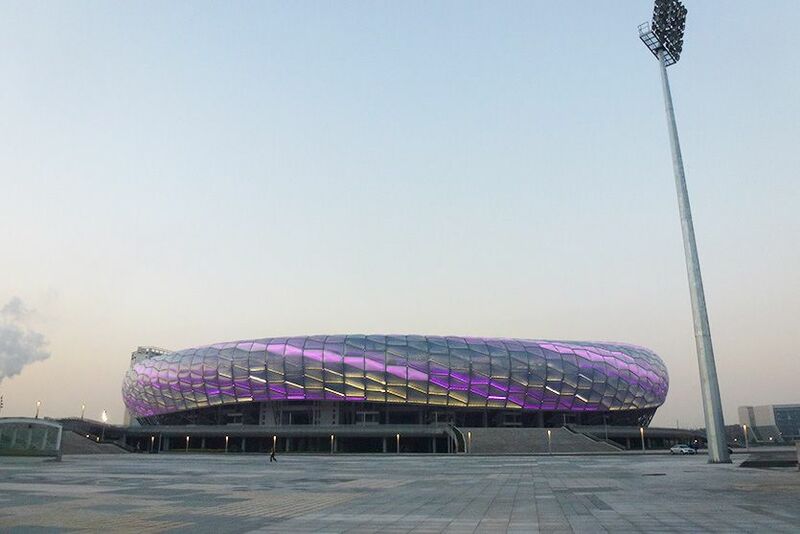 The Dalian Aerbin, successor of honoured Dalian Shide, consider using the stadium for most important fixtures.